When the weather outside is frightful and everyone starts getting cabin fever, it’s easy to get mopey and just sit in front of the television. The next time one of your children moans they are bored, get everyone outside, embrace the snow, and get moving. For those days when it’s just too nasty to go out, stay in and use your imagination to make some fun. To help you get through these long winter months, try any of these ten inexpensive family winter activities. 1. 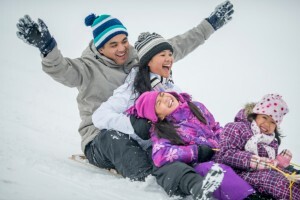 Sled Down Hills – For some fun and inexpensive outside merriment with your family and friends, go sledding. If you don’t have a sled or toboggan, borrow one from a friend or make your own using cardboard and duct tape. This activity is fun and terrific exercise. You’ll work up so much heat climbing back up the hill that you won’t even mind the cold. And, don’t miss this great opportunity for a cute, family photo. Lace-Up Your Skates – Grab your skates and head to the nearest frozen lake or pond. If you don’t have skates, you can wear sneakers and grab a broom for a fun game of hockey. It’s all about getting everyone outside and moving around for some fun exercise in the exhilarating winter air. Build the Perfect Snowman – To add some humor to your snowman, try making it upside down or dress it with flair to make it your own. Swish on the Slopes – Skiing is great fun and a wonderful family activity. Many ski resorts offer special savings to active military personnel and their families. Visit our “Discount Ski Lift Tickets and Other Deals for Military Members” blog to learn more. Start a Family Movie Night – Pick a family movie that adults can also enjoy. Make some microwave popcorn and package it in movie bags or boxes purchased from the dollar store. Then, to get your children really engaged, assign them a job such as: making the tickets, selling the popcorn, and ushering the attendees to their seats. Role playing will help get everyone into the spirit. Learn other easy ways to make movie night fun and get some suggestions on movies. Organize a Food Festival – Invite neighbors and friends to create a food festival. As a twist on the popular potluck dinner, ask each family to create a dish, play some music, and bring some props to match their culinary theme. This is a great way to get everyone together for delicious food and company without spending a lot of money eating out. Make Snowflakes – Get everyone in the family involved in making the perfect paper snowflake. Follow these six easy steps to create them and then hang them around your home to add a warm, cozy winter touch. Host an Indoor Camp-Out – Bring camping inside by pitching a small tent in the family or living room. Make a mock campfire by rolling brown packing paper for the logs and using an artificial candle for the flames. No stick is needed to toast marshmallows; just heat your oven and toast marshmallows under the broiler for 2-3 minutes on an ungreased cookie sheet. Turn off the lights and use flashlights to read and tell scary stories. For a project to keep the night moving along, send the kids outside to gather some sticks, leaves, and winter berries. Then, have them build a nature loom by weaving the things they’ve collected. Attend a Free DIY Workshop – Try out a free DIY workshop from a home improvement store such as The Home Depot, a craft store such as Michaels, or a computer store such as Apple. Learn about Apple’s free workshops for people of all experience levels, along with youth programs like Apple Camp and Field Trip.